The Zimmermann Telegram was a proposal by Germany to Mexico in January 1917 to join Germany in a war against the United States. The telegram was intercepted by British spies and given to the press by President Woodrow Wilson, outraging American public opinion and providing a "casus bellum" (a formal cause for war) and was one of several reasons for Congress to declare war on Germany on April 6, 1917, bringing the U.S. into World War I. Relations between the U.S. and Mexico were very bad and there was a risk of war between the two. The telegram was sent by German For­eign Minister Arthur Zimmermann to the German ambassador to Mexico on January 19, 1917, who carried the proposal to the Mexican government. Mexico realized the proposal would make it a satellite of Germany and would lead to quick defeat by the vastly more powerful U.S., so it wisely ignored the message and remained neutral in the World War. The Zimmermann Telegram (spelled with two n's) is considered one of the worst blunders in diplomatic history. Between August 1914 and November 1918, the European nations fought the Great War (now called "World War I"). While armies battled in Europe, the United States remained neutral, in 1916 electing Woodrow Wilson for a second term as president, in part because of the slogan "He kept us out of war." By January 1917, however, the situation in Germany had changed. There seemed a very good chance to win the war. American entry was discounted because the US was already shipping supplies to Britain and France, and the U.S. had a very small army. The German navy convinced the German army and Kaiser Wilhelm II that a resumption of unrestricted submarine warfare could help defeat Britain within five months. German policymakers argued that they could violate the “Sussex pledge,” because the United States could no longer be considered a neutral party after supplying munitions and financial assistance to the Allies. The war would be won before American forces could make much difference. Germany’s civilian Chancellor, Theobald von Bethmann-Hollweg, protested this decision, as he believed that resuming submarine warfare would draw the United States into the war, which he argued would lead to the defeat of Germany. However the civilians did not control decision making; the military made the decisions and controlled the Kaiser's thinking. The Kaiser decided to resume unrestricted submarine attacks on all Allied and neutral shipping within prescribed war zones, reckoning that German submarines would end the war long before the first American troopship arrived in Europe. Accordingly, on January 31, 1917, the German Ambassador to the United States, Count Johann von Bernstorff, presented U.S. Secretary of State Robert Lansing with a note declaring Germany’s intention to restart unrestricted submarine warfare the following day. Stunned by the news, President Wilson went before Congress on February 3 to announce that he had severed diplomatic relations with Germany. However, he refrained from asking for a declaration of war because he doubted that the American public would support him unless American ships were actually sunk. That soon happened as throughout February and March 1917, German submarines targeted and sunk several unarmed American civilian merchant ships, and some American passengers and seamen died. On February 26, Wilson asked Congress for authority to arm American merchant ships with U.S. naval personnel and guns. Public opinion strongly supported the measure, but several anti-war senators led a successful filibuster that consumed the remainder of the Congressional session. The bill never passed. Regardless, Wilson decided to arm American merchant ships by executive order, claiming that an old anti-piracy law gave him the authority to do so. To protect their intelligence from detection and to capitalize on growing anti-German sentiment in the United States, the British waited to present the telegram to President Wilson. Meanwhile, frustration over the effective British naval blockade caused Germany to break its pledge to limit submarine warfare. In response, the United States severed diplomatic relations with Germany in February. 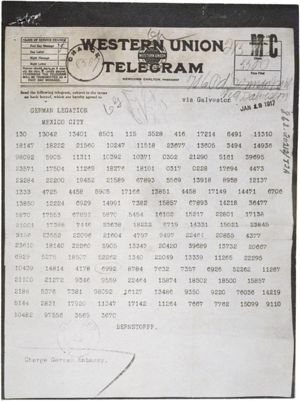 The British had initially not shared the news of the Zimmermann Telegram with U.S. officials, because they did not want the Germans to discover that British code breakers had cracked the German code. However, following Germany’s resumption of unrestricted submarine warfare in February, the British decided to use the note to help sway American official and public opinion to join the war. The British finally forwarded the intercept to Wilson on February 24. The American press carried the story the following week. Despite the shocking news of the Zimmermann Telegram, Wilson still hesitated to ask for a declaration of war. He waited until March 20 before convening a Cabinet meeting to broach the matter—almost a month after he had first seen the telegram. The precise reasons for Wilson’s decision to choose war in 1917 remain the subject of debate among historians, especially in light of his efforts to avoid war in 1915 after the sinking of the British passenger liners Lusitania and Arabic, which had led to the deaths of 131 Americans. However, by 1917, the continued submarine attacks on American merchant and passenger ships, and the “Zimmermann Telegram’s” implied threat of a German attack on the United States, had served to sway American public opinion in support of a declaration of war. Furthermore, international law stipulated that the placing of U.S. naval personnel on civilian ships to protect them from German submarines already constituted an act of war against Germany. Finally, the Germans, by their actions, had demonstrated that they had no interest in seeking an end to the conflict (this included Zimmermann's own statement on March 29 confirming he sent it ). These reasons all contributed to President Wilson’s decision to ask Congress for a declaration of war against Germany. They also encouraged Congress to grant Wilson’s request and formally declare war on Germany. Beesly, Patrick. Room 40: British Naval Intelligence, 1914-18. (1982). Freeman, Peter. "The Zimmermann Telegram Revisited: A Reconciliation of the Primary Sources." Cryptologia 30, no. 2 (Apr. 2006): 98-150. "PLOT AWAKENS CONGRESS; Party Spirit Engulfed in Patriotic Zeal to Back Wilson. SENATE DEBATE WAXES HOT Republicans and Democrats Assail Stone, Insisting on Asking President's Source of Facts. FEW DETAILS DISCLOSED But Lansing Has Zimmermann Note," New York Times, Mar 2, 1917. ↑ The main reason for war was the actual German attacks on American ships. This page has been accessed 22,149 times.